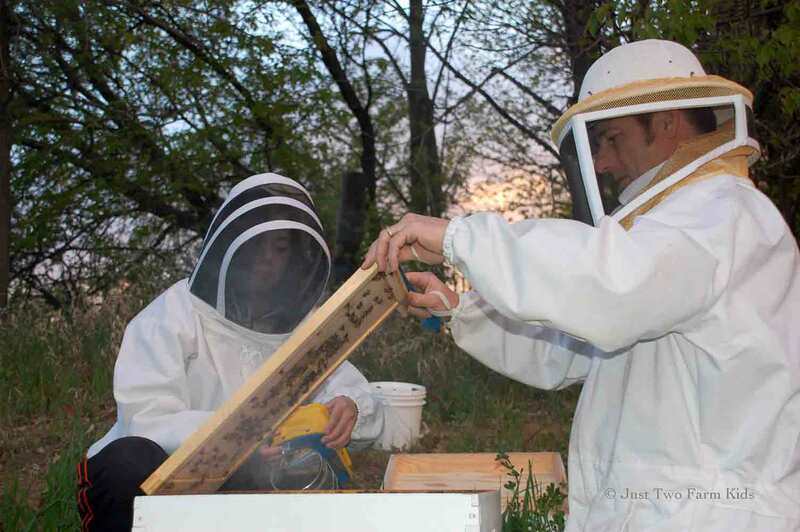 Even with our limited experience as beekeepers (one season), we knew right away that things did not look right. The brood pattern was uneven and had this popcorn look, which are actually drone cells. Drones are the male bees, which are from an unfertilized egg. The drone cells are similar to, but larger than worker bee cells. The number of drones per colony should be only around 15 percent of the total population. We saw very few worker bee cells. We decided to see what was going on in the second hive. 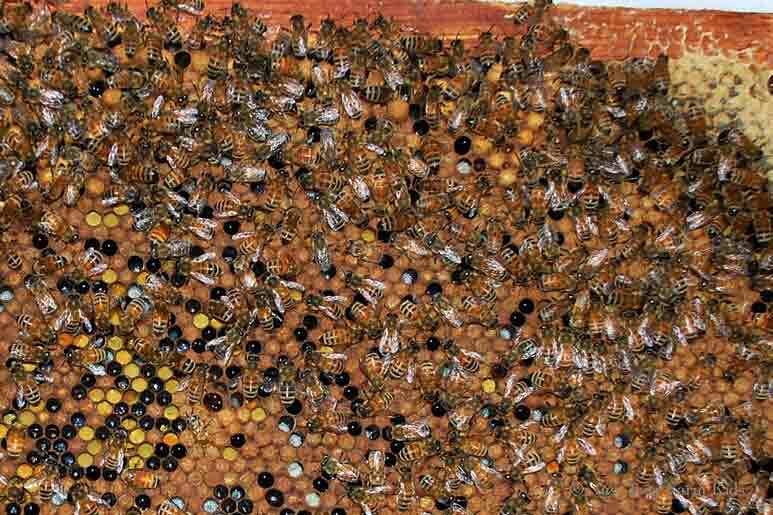 This hive had a normal brood pattern, with worker bee cells filling most of the center of the frame with a few drone cells scattered around the edges. 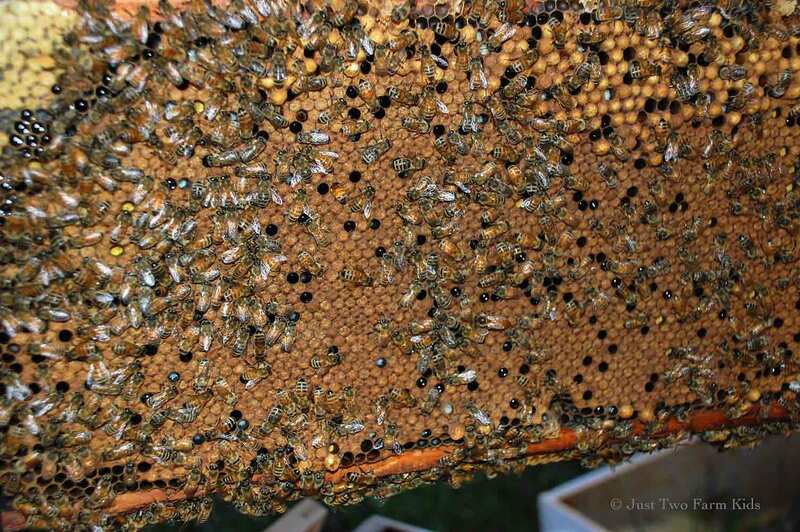 After seeing this hive, we were convinced that our new queen was deficient in the re-queened hive. Here is a comparison of the brood patterns in the two hives. 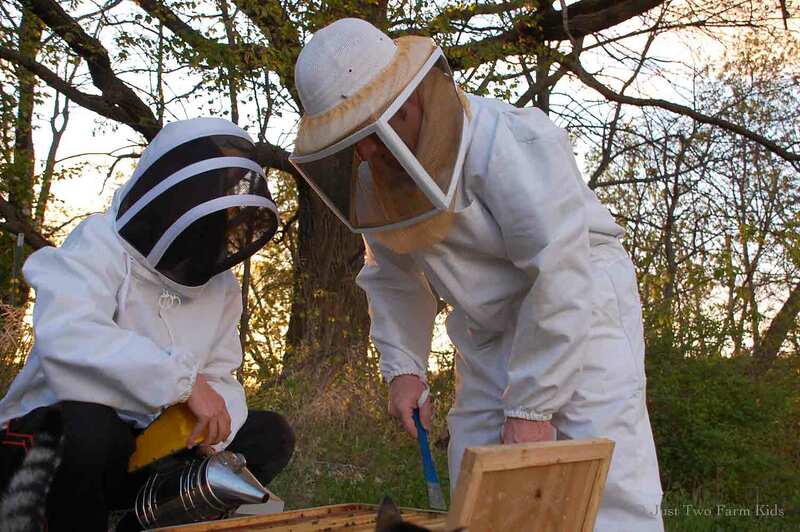 It was time to ask for some expert advice, so we contacted our bee-keeping mentor, Paul. He volunteered to stop by and check out what was going on in the hives. After a quick peek in the re-queened hive, he confirmed that our new queen was deficient, most likely because of improper mating. Since the colony would inevitably fail without intervention, he suggested that we kill the new queen and take a frame of brood from the healthy hive that contained eggs so that the worker bees could make their own queen. 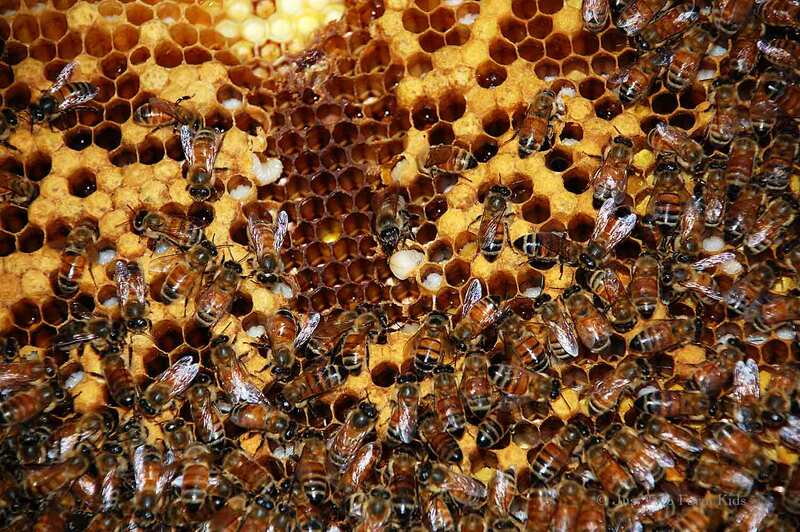 The sudden loss of a queen usually prompts worker bees to make emergency queen cells out of worker cells. Paul skillfully located the deficient queen, squished her, and walked her a good distance away from the bee hives to dispose of her body. He then found the queen in our good hive (we have never been able to find her, so it was fun to watch a pro) to find where the freshest eggs were. Making sure the queen was not on the frame, he took a frame of brood and placed it into the new hive. If the bees function properly, they will start making a new queen immediately. The worker bees will make multiple emergency queen cells, and the larvae inside will be fed a special substance called royal jelly during their development. A queen bee takes about 15-17 days to develop from a fertilized egg to an emerged bee, compared to about 21 days for a worker bee. It has been about 9 days since the queen was “removed” from the hive. We will check on the hive in the next few days to see if there are queen cells present. Until then, we will keep our fingers crossed that the bees are taking steps to rear a new queen. That sounds so exciting, and um, scary!